The epic role-playing series from BioWare takes a thrilling leap forward with the power of Frostbite 3. Beautiful vistas and incredible new possibilities await you. Ready yourself for Dragon Age: Inquisition. A cataclysmic event plunges the land of Thedas into turmoil. Dragons darken the sky, casting a shadow of terror over a once-peaceful kingdom. Mages break into all-out war against the oppressive Templars. Nations rise against one another. It falls to you and your party of legendary heroes to restore order as you lead the Inquisition, hunting down the agents of chaos. Bonds will form and some will break as the campaign for truth takes its toll. BioWare's latest action-adventure delivers an unparalleled story set in a vast, changeable landscape. Explore hidden caves, defeat truly monumental creatures, and shape the world around you based on your unique play style. Explore, lead, and battle: Tough choices define your experience, and even one decision can change the course of what's to come. 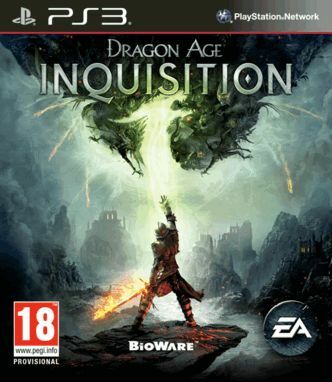 Become the Inquisitor: Wield the power of the Inquisition over the course of an epic character-driven story, and lead a perilous journey of discovery through the Dragon Age. Bond with Legends: A cast of unique, memorable characters will develop dynamic relationships both with you and with each other. Discover the Dragon Age: Freely explore a diverse, visually stunning, and immersive living world. Change the World: Your actions and choices will shape a multitude of story outcomes along with the tangible, physical aspects of the world itself. Play Your Way: Completely control the appearance and abilities of your Inquisitor, party of followers, outposts, and strongholds. Decide the makeup of your Inquisition forces and your own style of combat.